Welcome to A10 Talk’s Top 25 Player Countdown. Each day, we publish a new article counting down the 25 best players in the Atlantic 10 this past season, as voted by our staff. Today, we feature #14 Otis Livingston II of George Mason. Otis Livingston II continues to make strides as a Patriot, now having completed 3 seasons, and quite frankly, I think he deserved to be higher than 14th on this list. Averaging 17.3 points and 4.4 assists per game, Livingston II really came out during conference play. 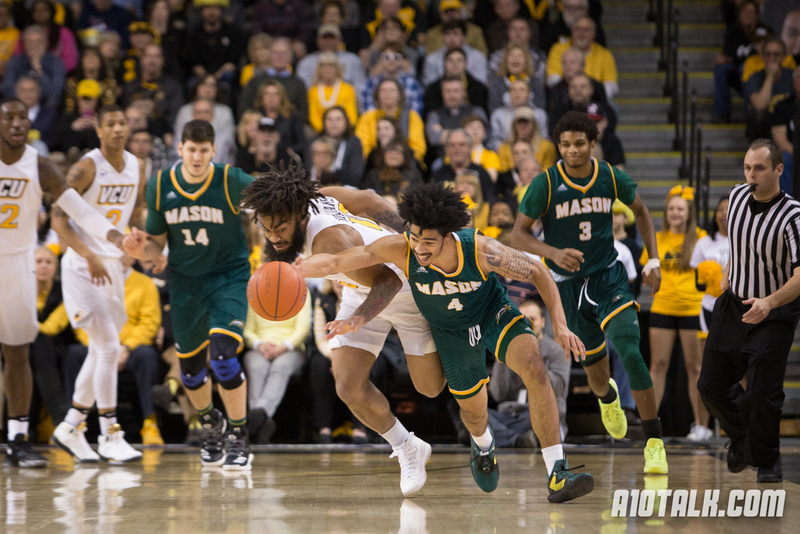 As GMU started to play better basketball at the end of the season, Otis Livingston II became the clear star of the show on a team that had some serious roster limitations. Earning the 5 seed in the Atlantic 10 Tournament, George Mason made something out of nothing because of Otis. Otis Livingston II’s most explosive performance last season had to be at home against Dayton where the junior dropped 7 threes and went for 29 points. Just a few weeks earlier, the Patriots would score a huge road win over Richmond behind 22 points, 6 assists, and 5 rebounds from Otis. Undoubtedly, Livingston II’s biggest night of the year came on the road against Massachusetts where he went for 33 points, dealt out 9 assists, and grabbed 6 rebounds. There were countless nights last season where the junior absolutely went off. 85.7%. Otis Livingston II was nearly impeccable from the line last season, shooting at an 85.7% clip; that ranked in the top 100 among players in the nation. The junior had cold blood when he stepped up to the stripe. 13. Otis Livingston II had 13 games with 20 or more points last season. He’s increased his PPG from 11.9 his freshman year to 17.3 his junior year. I’d only expect more in the coming season. It seemed like yesterday when Otis Livingston II was a freshman learning the ropes on this George Mason squad. Now, he’s Dave Paulsen’s senior leader going into a year where expectations are lofty. After the way they closed the previous season, the Patriots could make some serious noise behind a lethal senior class. I’d expect Otis Livingston II to be even more improved in 2018-19, and that’s a scary thought.